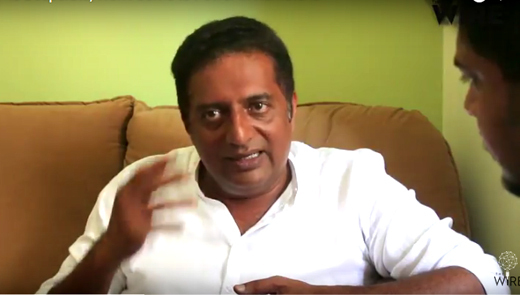 Udupi, May 01: Actor Prakash Raj has hit the campaign trail in Karnataka with a single-point message for the people: keep doubting, keep asking. A known critic of the BJP, he has left the comfort of social media and is canvasing extensively on the ground against the saffron party. As much as he would like to assert his independence, he has had to face much criticism for his overtly political role from sections of the Right. However, he says that does not bother him because defeating BJP’s “communal and divisive” politics is his top priority at the moment. You have named your campaign #justasking. What are you asking? Just Asking, a foundation now, is a movement by itself. We think it will remain like this for the next ten years. It was a hashtag I started on social media when I started asking questions. I received great support across India. This is the second round of tour in Karnataka. I started touring the state three-four months ago, trying to connect with like-minded people. Now, there is a #justasking team in every district. Our team comprises lawyers, retired IAS and IRS officers, students, lecturers, writers, doctors etc. who have a similar thought process. I thought this was not the time to just sit in our own islands. And if your voice has to be heard, there has to be a connect. I have succeeded in getting many of these people together under one platform. What are the fundamental issues you are raising? The most important issue we are raising is why does a government propagate a religion, instil an ideology? We need to understand its agenda. One thing is clear that the (Union) government is not interested in progress and administration. Basically all political parties in India are parties by themselves. But here is a party (the BJP) which is run by a different organisation. Yes, naturally. When the writing is on the wall, there are no conspiracy theories. Isn’t it really obvious from the way they are going? Somebody has to call a spade a spade. We have seen across the world how such political agendas end up. For me, this is a more important issue than corruption. Take Pakistan, for instance. When the whole country is consumed by religion, what happens? There is no progress, there is poverty, there is no science. The current government is taking this country back to the stone age. I can’t let that happen. So you think the Modi government is driving India away from its liberal-democratic traditions? Isn’t it really obvious? Look at the leaders speaking. Modi ji is asking his ministers and party members now to keep quiet, to stop giving “masala” to the media, to stop motor-mouthing. I want to tell you, my dear prime minister, they are speaking the truth. I thank them because they are speaking. Otherwise we wouldn’t have known what is inside them. So you need to take action against them, you need to disown them, not ask them to keep quiet. You think that what they have said is “masala”. These are thoughts which are disturbing the social fabric of this country. You are one of the popular actors who have taken a strong position against Hindu majoritarianism. How do you think BJP’s Hindutva shows itself on the ground? We have to understand how the BJP has been successful. They are not talking about Hinduism. They are trying to bring Hindu majoritarianism by creating hatred against other communities. They create scare. They tell you that the other communities will throw you out. They say that the the very existence of Hindus will go. They are not talking about the spirit of dharma. In a democracy, even a single individual has his own dharma. If you want to propagate dharma, you have every right to build temples, build maths. But the government cannot do that. The government’s job is to be equal to everybody. That is how the constitution is formed. Now they say that they will change the constitution. That is their narrative. See, dharma should enrich you. It should not destroy you. It has to be like a lamp that shows light. It cant be a fire which burns things down. When a man is struggling to survive, he may get threatened. The animal instincts in a man may come out. But we need to tell people that this is not how things are. We need to keep telling people that they are spreading hatred. Many BJP supporters have indirectly alleged that you are batting for the Congress by speaking out against BJP. See, whenever someone comes to speak out, everyone has the right to doubt that person until they hear him out. But I have the patience. I am not interested in a T-20 match. I am here for the long haul. I will continue to talk. See so many people are using the #justasking now. Slowly, it will gather more traction. My success will not depend on whether I am able to mobilise one lakh people or not. But one speech, one speech of mine, one jibe of mine, if it is shared and discussed by people on different platforms, it is a success. That is a slow revolution. I believe in whatever I say. I have the facts with me. The problem with the BJP is that they did not anticipate me emerging as a critic. Unlike political parties, I am just a citizen. I have not here to grab political power. I speak with conviction. Modi ji says that 120 crore people are with him. That is a big lie. The BJP is not there is Karnataka, Telangana, Punjab, Goa, Tami Nadu, West Bengal, Kerala. Even in states where they are in power, there is opposition to them. The problem is that political parties believe that once they are voted to power, everyone is with them. That is not true. People have the right to change the government every five years. People can throw them out of power. What the BJP is doing now is instead of talking about governance, they are getting into religion, which in Indian society is the most revered thing. They work in the grassroots like that. That is the most dangerous thing. The problem is that by the time they go, they would have already inflicted deep wounds in society. Our job is to prevent that, keep telling people the truth. We need to explain and expose their narrative.